Rolani Burek, Rolled Borek, Kol Boreği or Börek. Traditional Bosnian, Croatian, or Turkish dish? Whichever spelling or geographical origins you let it claim, this phyllo dough meat pastry is delicious and visually very cool. Made by wrapping seasoned ground beef in long rolls of phyllo dough and then wrapping it to form a spiral, this meat-snake thing makes an amazing cross-sectional cut (note to self: make “Meat-Snake Thing” the name of my future Captain Beefheart cover band). Look at all those layers and pockets of dough! (second note to self: make “Pockets of Dough” the name of my future Puff Daddy art project). 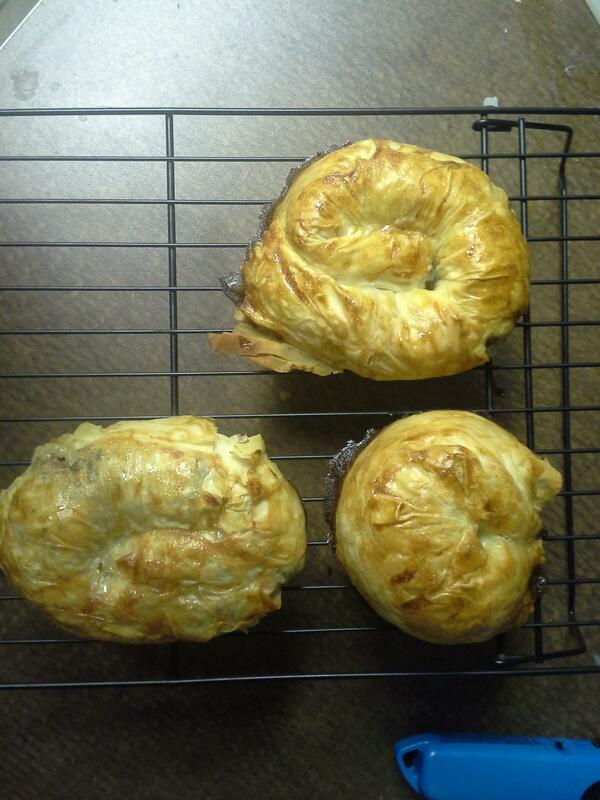 This homemade burek recipe is easy and fun. A friend who spent some time in Croatia also told me that this is the best late night snack. BRB conducting original research on this hypothesis. Make filling. Heat a splash vegetable oil in a large skillet and cook onions until translucent (~5 min). Add ground beef, red pepper flakes, pepper and salt and cook until brown. Allow to fully cool. Make filo pastry coating. Whisk egg, yogurt, vegetable oil and water. Lay out a rectangular sheet of filo pastry and brush with the filo pastry coating. On the edge of the short end of the rectangular sheet of filo pastry, scoop a thin line of meat filling. Gently roll up the meat filling in the filo pastry sheet until you’ve formed a snake-shaped roll. Starting from one end of the snake-shaped roll, fold the roll into itself to form a spiral shape. In a vegetable oil-brushed springform pan or tray, place the burek in the center. Repeat #7 and wrap around the outside of the burek until pan is fill or the burek is at the size desired. Beat egg and yogurt together and brush top of burek. Imgur user ParanoidFighter made this for office lunch and I have a feeling that Janice in Accounting is gonna side-eye you for this one. Amazing job! Made this at home? Tag your photos with #PateSmith or share them in the comments for the chance to be featured onsite!